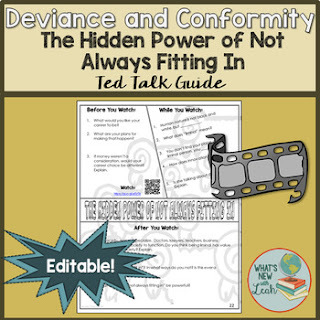 This is an editable, short film guide for the Ted Talk, “The Hidden Power of Not Always Fitting In.” I show it to my sociology students at the end of a unit about Deviance and Conformity. Often, our students believe that they have to find a niche and specialize. The speaker of this talk discusses the benefits of being multifaceted instead. She argues that not conforming can lead to innovation. This is an engaging talk that enables students to consider the power of creativity and individuality.